Are you constantly behind on your work or projects? Do you have a messy desk with several little stacks on it? Is there never enough time to finish all you have to get done? If the answer is yes, you could be suffering from procrastination. Procrastination is a crippling disease. If you are not productive at work it can ruin your career. Many people do not even know why they procrastinate or will even recognize that they do it, even when co-workers or their boss brings it up to them. Usually, they have plenty of excuses as to why they have not completed their assignments, or goals and what is amazing is they are the only one who really believes it. The link below is to a great article by Psychology Today. 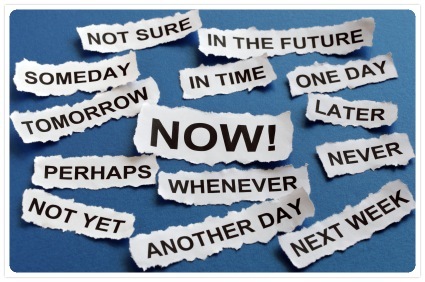 An interesting fact about people who suffer from procrastination is that they are not born that way. Procrastination is learned, it is difficult, but if one wants to stop, there is something you can do. There is no magic wand to wave to overcome procrastination, but if you begin to take small steps your life will be much different and the people you work with will be much happier and more productive because you are. This entry was posted on Monday, August 15th, 2016 at 8:00 am by Tina Del Buono, PMAC. Filed under Co-worker Problems, Manager Topics, Psychology, Self-improvement, Self-motivation, Work Issues. You can follow any responses to this entry through the RSS 2.0 feed. Both comments and pings are currently closed.